The Bedouin Experience — Castles in the Sand - Boutique luxury holiday villas to rent in Essaouira, Morocco. Discover Morocco’s Secret Paradise! Join us for a “once-in-a-lifetime” outdoor adventure – an authentic Bedouin camp experience. An incredible and rare opportunity to experience one of the most beautiful, local only known parts of Essaouira’s stunning coast. We have partnered up with a very dear friend, Mohamed, who has kindly agreed to allow clients access to his rural estate where you can enjoy a delicious authentic Moroccan lunch or dinner al fresco, private guided trek of the sand dunes to explore the waterfalls and time to chill on one of Morocco’s most secluded and secret beaches. The more adventurous may wish to camp under the stars in a Bedouin tent, enjoy a BBQ or traditional Moroccan meal and open camp fire. Private excursion. Available exclusively to Castles in the Sand clients. Camping is optional. Breakfast included for overnight stays – all you need is your toothbrush and sleeping bag! For bookings, please speak to Emma who will be happy to make arrangements based on your requirements. Mohamed is one of Emma's oldest friends in Essaouira, having met shortly after her arrival in Morocco, they've been firm friends ever since. His friendly, warm nature and unmistakable cheeky charm has made Mohamed a firm favourite with clients. Morocco's answer to Bear Grylls, Mo's playful character paired with an in-depth knowledge of all things 'boy scout' and the local area make him a key member of the team. Prior to establishing his “Bedouin Experience” for Emma's clients, Mohamed worked with Essaouira's finest hotels and restaurants to supply high quality, fresh seafood. He's also an incredible chef (just wait until you try his banana salad, no joke!) and what he doesn't know about fresh fish/local ingredients just isn't worth knowing. Mohamed's family often feature in the Bedouin Experience, with his mother helping to cook an authentic Moroccan meal or his auntie serving up sweet Moroccan tea to clients at her home. 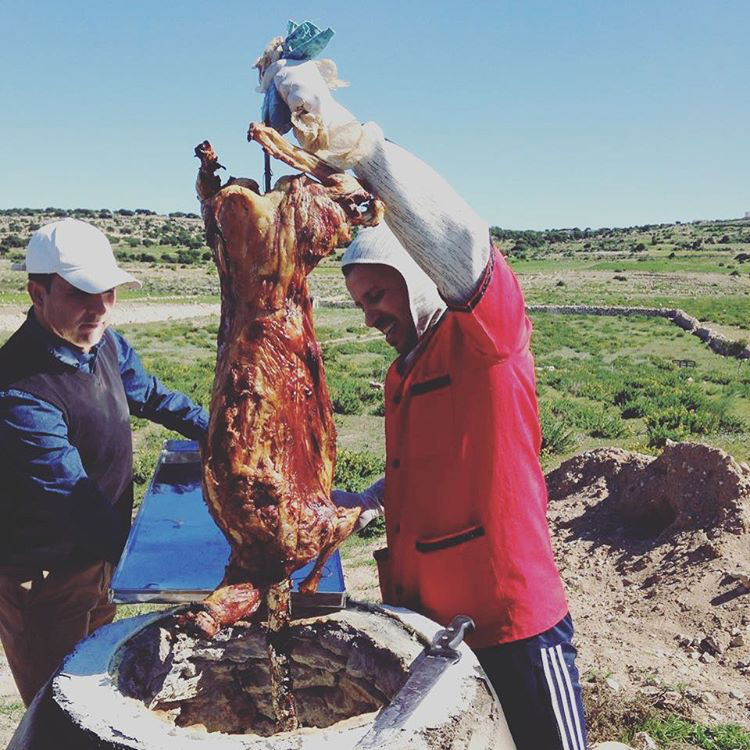 You simply don't get a more genuine or authentic Moroccan experience than this. Timelapse video: Behind the scenes set up of the Bedouin experience with Mohamed. Ben and I went to Essaouria for a few days at the beginning of February. Both of us had been there before but years ago. We were greeted by Mohamed and Emma, who made our trip the most seamless magical experience ever. We had things that we had planned to do but the highlight was being taken by Mohamed to the most wonderful deserted, enormous wild beach, where we had the pleasure of meeting his divine family. We spent the day exploring, going from beach to grassy waterfalls, rock climbing for fossils and walking for miles along deserted sands... We then returned to the most incredible feast – BBQ’d fish, served with the most insanely delicious ‘mumas’ version of baba ganoush... incredible food, such warm hospitality and an honour to be looked after by such a lovely family! A wonderful contrast to drive south for about an hour to a stretch of beach where Mohamed and his family own a plot of land overlooking the endless wild sandy beaches that fringe the coast of Morocco. It is amazing to me that you can still come across such beautiful beaches completely free of development so close to Europe. We were the only people there – apart from some fishermen, running along the shore, trying to guess where the shoals of sea bass would be, then casting their nets. After an hour or so wandering along the beach in the warm winter sun, we clambered up the dunes and retraced our steps inland, past a waterfall. We returned to the little hut overlooking the beach where Mohamed’s mother and niece were barbecuing a delicious feast. To sharpen our appetites we went for a swim in the surf – in December (much warmer than Cornwall)! Then lunch – served to us sitting on cushions under an awning overlooking the shore – fresh fish, salads, dips and something delicious to drink. Still not a soul to be seen in either direction as far as the eye could see. Our family day out with Mohamed was truly astounding, a perfect introduction to the beautiful and unspoilt Essaouira and its surroundings. We spent our day on a private beach, played in the sand dunes, rode camels to a waterfall, ate a delicious BBQ of the morning’s catch of sardines, homemade keftas and delicious salads. We enjoyed chatting to Mohamed and learning more about his fascinating and welcoming country and culture. As the sun set, we were given traditional sweet Moroccan tea and local cakes. It was a beautiful and peaceful day. We visited one of the most spectacularly vast, and seemingly never ending, beaches and saw only two other souls on it the entire time – both local fisherman going about their duties. After our walk, Mohamed’s lovely family cooked us a feast of fresh meat and fish served with plenty of olives and wine. We sat round inside a beautifully constructed Bedouin tent and took shelter from the December sea winds. After food, we all sat around playing cards and taught Mohamed our favourite game which, by the second round, he had mastered and subsequently put us all to shame. A big thank you, we had a great time in Essaouira – and with Mohamed. He took us to the argan oil place and his auntie’s house who kindly made us tea. We then headed to his land and had a long walk on the beach and to the waterfall. Mohamed was a great host and he’s a really nice guy. The place is truly special and I would recommend doing that to anyone! We also went riding with Jawed, which was also super nice. First time on a horse for me, Jawed was great.